I know, I know. It’s a weird title. Let me explain. As you know, I’m trying to cut back on the amount of carbs I eat. Back before I was diagnosed as a diabetic, I ate a lot of pasta. Whole wheat pasta! I thought I was being virtuous. Turns out, not so much. I’ve written often about my unsettling love for tomato sauce. For me, nothing beats a big bowl of fusilli pasta and homemade meat sauce. I could eat that for the rest of my life and not get tired of it ever. But pasta is high-carb, so after I got over my denial of being a diabetic, I began looking for ways to cut carbs but still indulge in a bowl of hearty meat sauce. Then I remembered this wacky thing my mom used to do when I was a teen. My mom is a terrific cook, but not very adventurous in the kitchen. But one day when we all sat down together for dinner, she plopped a half a squash down in front of me and then covered it in tomato sauce. I wasn’t even sure what to think at first. It was delicious! It only looks scary, I promise! 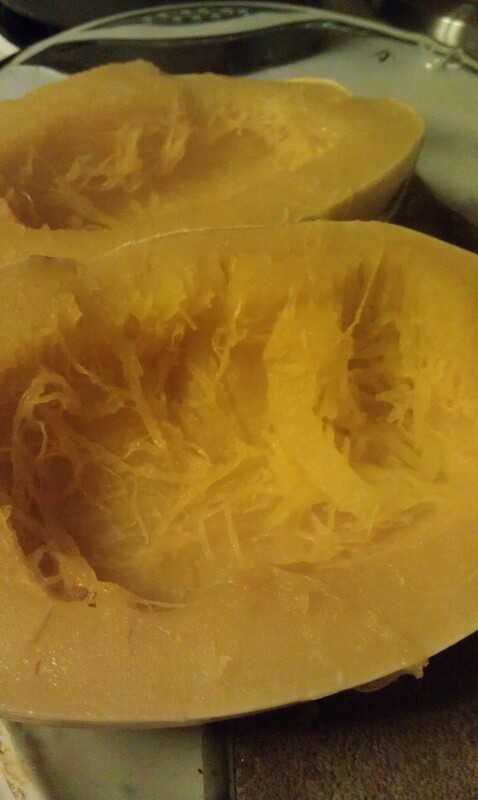 Spaghetti squash, as it is called, is a pretty amazing thing. It has the same general shape as a watermelon, but a little more oblong. Inside, it’s sort of looks like butternut squash — it has some seeds in the center you have to scrape out after cutting the thing in half lengthwise. Then you put the squash cut-side down in a glass pan with a little water in the bottom into an oven heated to about 350 degrees. After about an hour, take it out, flip it cut-side up and run a fork through the flesh. You’ll get strands that look somewhat like angel-hair pasta. Pour some sauce over it and you have a pretty hearty dinner without the carbohydrate bomb in a heaping bowl of pasta. Per cup of spaghetti squash (prepared with no added salt or fat), there’s only 42 calories, 10 grams of carbs and 2 grams of fiber. I usually split each half of the spaghetti squash into two servings, so there are 4 servings per squash. I find spaghetti squash to be a little on the sweet side. Not butternut squash sweet, but definitely partway there. To counterbalance the sweetness, I make my sauce pretty spicy by adding ground cumin and chili powder. Now — where’s the rainbow part of all of this, you ask? I added sautéed spinach, shredded carrot and some zucchini to my sauce to bulk up the veggies. So that gives you red, orange and green. Add the squash and you have most of the colors of the rainbow. Studies show you should be eating a variety of colors of veggies and fruits every day. This dish definitely adheres to that rule. I also added very lean ground beef to my sauce to add some protein. This would also be good with sausage or meatballs, though. I don’t have an exact count on calories, fat, carbs, fiber or protein. For Weight Watchers, I added up the points from the plain tomato sauce and for 2 oz of lean ground beef (which I mixed into each cup of sauce to make sure it was completely accurate). All the veggies are “free,” and I added about 2 cups of uncooked spinach, which cooks way down when sautéed in cooking spray, and about a half-cup each of shredded carrot and zucchini rounds. I counted the spaghetti sauce’s points because I used a jarred sauce as a base and the nutrition facts were on it. If you make tomato sauce from scratch and only use tomatoes and spices, it would be “free” too on the WW plan. All together, I calculated my meal as being 7 WW points. I found a nifty little recipe calculator online that you can use to calculate recipes by entering the amount of ingredients you use and then dividing by the number of servings. Share your favorite tomato sauce recipe in the comments and let me know if you use the calculator to get nutrition info per serving. So there you have it, a veggie-centric spaghetti and meat sauce that takes most of the carbs out of the equation. Enjoy! Your turn: What exotic veggie or fruit have you tried and loved? How do you prepare it? One of my goals for the month is to eliminate fast food. I am a newspaper reporter, so I eat a lot of meals at my desk or in the car. My unpredictable hours mean I am rarely home to cook. But instead of planning ahead, I usually stop for a bacon burger ( Ok, a bacon double burger) and a sack of fries on my way to an assignment. That won’t work any more. So tonight, I spent some time in the kitchen. I bought a bunch of veggies at the grocery store tonight, including spinach, a red bell pepper, zuchinni, a red onion, mushrooms, cherry tomatoes, spaghetti squash, broccoli and baby carrots. I roasted everything but the spinach to use as a filling for omelettes and as a topping for pita bread “pizza” for breakfast and lunch this week. I destemmed the spinach and sauted it before throwing it into some spaghetti sauce with some lean ground beef. I also roasted a spaghetti squash instead of using pasta to save myself some carbs. And there you have it. Four nights’ worth of dinner, and the makings for at least six breakfasts and lunches — all in about an hour. Now that’s what I call fast (and healthy) food. Your turn: What are some of your fast, healthy recipes?